These words were so harsh and so judgmental that my natural reaction was to ignore them and work up a strong dislike for the messenger. Couldn’t he have used a euphemism like “chubby”? 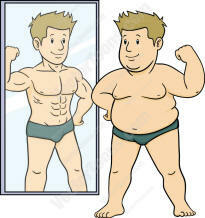 Sure, I knew I was overweight, but when I looked at myself in the mirror I certainly didn’t see obese. I might have ignored this comment, except it came from my doctor. I did what I do in my professional life...I argued. My first defense pointed to the fact that I’m a healthy eater and that I exercise regularly. He was unmoved. He told me I needed to lose weight. Next I tried a tact I perfected back in middle school, by trying to turn the tables and point out that the doctor wasn’t so thin either. I was apparently not the first to use this tact, because he quickly replied that at least he wasn’t obese. Ok, I get it. I’m obese. I spent a few months wrestling with his words. I needed to approach this in my own way. I needed to do some analysis, a little research and a lot of thinking. My first conclusion was that given my age, it was now or never. I’m in my mid-fifties and I recognized that this is the time to get healthy. But, whoever dreamt up that BMI chart and thinks that’s what I should weigh, is clearly insane. Next I went through a phase of self-pity. How had this happened? I managed to excuse my weight gain by running the numbers and concluding that over the past 30 years I had simply overconsumed an extra 25 calories too many every day. That’s a mere Hershey’s Kiss worth of calories too many every day and who could deny me one Kiss?! I was listening to a podcast of a University Lecture on physics when the professor stopped his planned lecture and as an aside said, “Want to know a sure-fire way to lose weight? Put less food in your mouth.” That was a simple enough that even I could understand it. Exercise was fine, but it was the intake that would drive results. In the process, I needed to learn more about me and what triggers me to eat. I realized that I had trained myself to eat when I wasn’t full and that I had to evolve to eat only when I was truly hungry. That might seem like an easy concept but for my thick head (and body) it was anything but easy. There were many who offered me advice on how to approach weight loss. I’m sure the advice was sound but somehow it didn’t fit inside my brain. I needed a diet strategy for me. I needed a guy’s diet. The idea of doing this over a long horizon was just too depressing. I wanted this done quickly. I set a goal for myself…35 pounds in 90 days. To do this I decided that I would virtually starve myself every day until dinner. I would hold dinner sacred, but would reinvent breakfast and lunch. I had to eat something during the day, so I sought out foods that had a magical combination: modest on calories but relatively filling. Taste was not something that entered into my equation. I concluded that before the hour of 6pm I would be limited to modest amounts what worked for me: Coffee, Diet Coke, jicama, celery, carrots, watermelon, hard boiled eggs, tofu and pinto beans. This was hard. Every time I passed the refrigerator I could hear it taunting me. When I drove past a KFC the smell caused me to momentarily black out. I certainly couldn’t watch anyone else eat and by 4pm every day I would have willingly eat a table. This was my Holocaust Diet. Dinner became the most important hour of the day. I was unsuccessful in my effort to convince my wife that we should eat earlier in the day. But when I did eat, I found it took less to fill me up and I appreciated feeling full, at least once a day, more than I ever had in the past. Yes, I stepped up my exercise routine, but mostly because for some reason when I’m exercising I’m not hungry. I’m easily distracted and that seemed like a good strategy. The psychology of weight loss for me required that I make this a competition. I’m competitive by nature and I like to win. Step one was to openly tell people that I was going to lose weight to create a level of pressure on myself. Next I set aggressive daily goals and I would punish myself if I didn’t hit them. At first this seemed to work really well. Magically, however, I found myself blasting through my daily goals. The pounds were just falling off. The elation was short-lived. I was using this old-fashion scale at the health club—you know the kind where you slide the weights. Before I stepped on it, I would set it to my goal and then I would step on it to see if I had hit my goal. Amazingly I always hit the goal. One day I entered the wrong goal and I hit that too! That was my last day using that “whatever weight you want” scale. As the weeks wore on, it got harder and harder to keep the pace up. The strategy around weigh-ins became increasingly more complex. I became a master of emptying my body of everything to the point of borderline dehydration. Who care about the occasional light headedness or the cotton tongue? Hell, isn’t this what jockeys did to hit their weight every day? This was what it took win…I just needed to man up. The weight continued to fall, but what wasn’t changing was how I looked to myself in the mirror. Same belly. I wasn’t seeing any real change in my body shape. This was a bit confusing because of the story the scales told and all of a sudden, the last notch on the belt wasn’t enough to keep my pants up. The spreadsheet that tracks my progress looks pretty good. As of this writing I’m no longer technically “obese” and just comfortably overweight. I haven’t hit my goal but I think I’ll hit it in my original timeframe. As of today, I’m only 318 Hershey’s Kisses away. By my math, that means I’ve lost 29 of the last 30 years of over eating. At this point, I have no strategy for maintaining my weight after hitting my goal. I’m all too focused on the celebratory chocolate milkshake or that all-you-can-eat buffet once I achieve my goal. Hopefully what sticks is the lesson I’ve learned that being hungry is merely a temporary inconvenience.